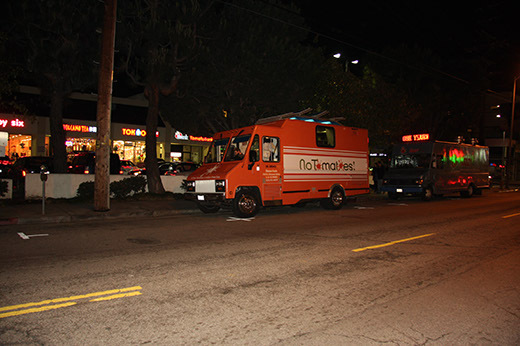 No Tomatoes is an Indian food truck that's been on the road for about eight weeks now. It gets its name from one of its co-owners' food-ordering habits. He noticed he was always asking for menu items sans the red fruit, and so he decided to turn that preference into his truck's gimmick. 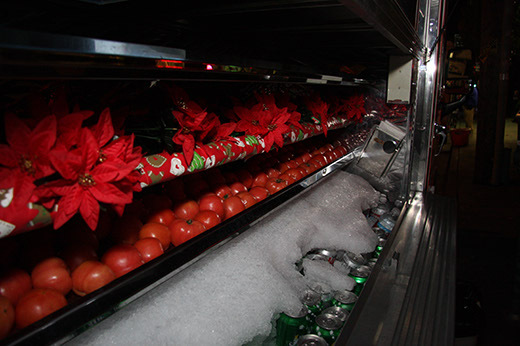 The cute thing is: the truck's soda-and-chips side display features a big stack of plump, bright red tomatoes. They're free, and you can ask for them to be included in any of the truck's dishes. 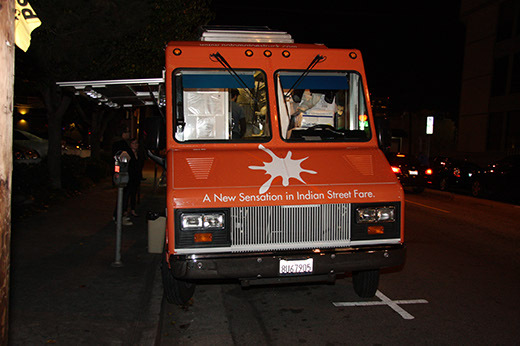 I paid my first visit to the truck on a freezing night in West LA, on Sawtelle and Olympic. Their menu included: a kathi roll - a whole-wheat wrap filled with either shredded meat or veggies; a chapli burger - ground beef or chicken on a burger bun with mint chutney and red chilies; and biryani rice, which is what I ordered. The dish consists of saffron-flavored biryani rice and tender pieces of chicken, garnished with red onion, cilantro and mint chutney. I got the combo ($8), which came with a drink and two samosas. My food came up super quick, and was piping hot. The spice level was perfect for a pantywaist like me - it was full of flavor, but not mouth-burning. 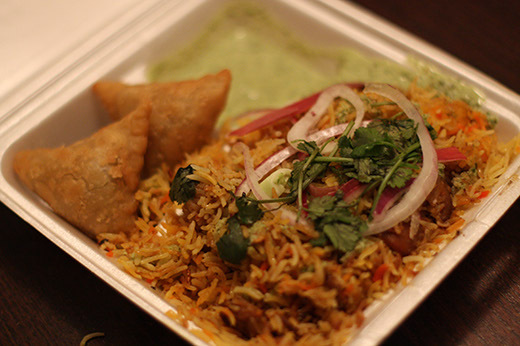 The biryani gracefully walked the line between succulence and greasiness without once stepping over to the dark side. The samosas were stuffed with ground beef and potatoes, and practically melted in my mouth. To heck with crispy samosas, I say; the doughier the better. These delivered. No Tomatoes served up some seriously delicious Indian street food. I felt like I'd eaten a decadent meal, but escaped the grease hangover that so often accompanies dishes like the ones I chose. I have only one request to make of these lycopene-eschewing folks: that they start offering desserts.